Pizza Pizza's Slices for Devices promotion is back! 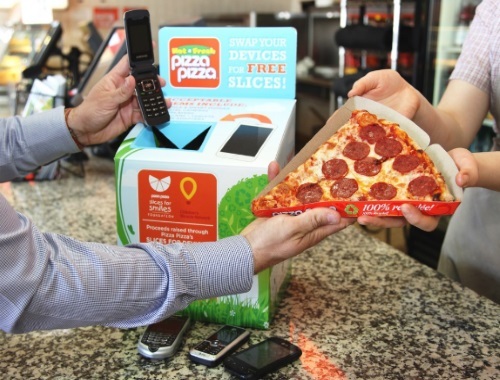 Now in its 13th year, the Pizza Pizza team has helped divert over 17,000 electronic devices from landfills to-date! Turn your old electronics into free slices of pizza! During the month of April (Earth Month) bring in your old electronics to Pizza Pizza and trade them into free pizza. Small electronic devices accepted during this promotion include mobile and smartphones, digital cameras, iPods and MP3 players, handheld gaming consoles. Offer is valid at traditional Pizza Pizza locations in Manitoba, Nova Scotia, Ontario, Quebec and Saskatchewan. Limit of four devices per person.